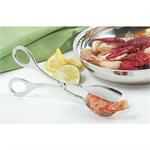 These 7" highly polished stainless steel tongs are an addition to any dinner party. Scissor style handles allow for ease and comfort, and the slightly rounded heads work great for finger foods, hors d'oeuvres, sliced meats and cheeses. The Best Balloon Whisks have thin, flexible wires and the bulb shape allows them to incorporate air and blend with minimal effort. 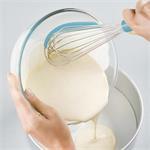 Great for many baking jobs such as making meringues, souffles, and whipped cream. 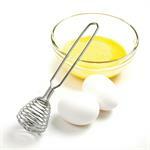 The Best Flat Whisk is designed for deglazing or making pan gravies in shallow pans or skillets. The unique, flattened shape of the whisk perfectly follows the bottom of a skillet, making sure that no spot is missed. The flexible spring wire design of the Best Coil Whisk can be used to scrape the bottom of shallow pans or whip small batches of light batters, scramble eggs, etc. 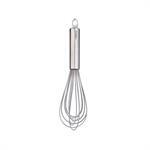 French whisks (or Sauce Whisks) look very similar to a balloon whisk, however the wires on a French whisk tend to be longer and straighter and without a bulb on the end. 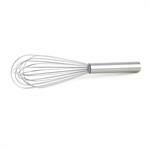 French whisks are designed for emulsifying and blending rather than whipping. 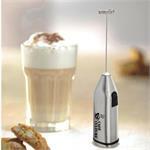 Re-define your mornings with a frothy latte, cappuccino, or hot chocolate. 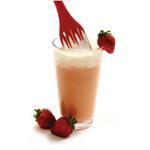 The perfect solution for thoroughly mixing protein powder shakes, powdered drink mixes, and salad dressings. 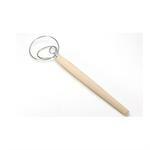 French, coil, gravy, or egg whisk but no matter what you call them they are a handy addition to your kitchen. 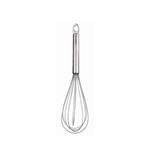 Depending on the job they can be used in a whisking motion to scramble eggs or scrapes the bottom of pan or bowl clean for sauces and gravies. 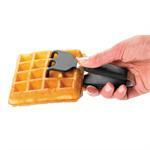 Perfect for waffles, but don't stop at that. Simultaneously grip and lift with these tongs - use the prong tips to grab and the flat side to lift. They won't scratch glass, non-stick, ceramic, or metal surfaces. 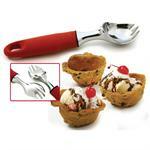 Spork prongs carve rock-hard ice cream with ease. 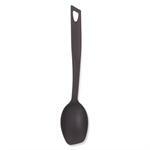 Its deep curve design effortlessly forms perfect scoops. 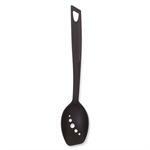 The Grip-EZ Sporks non-slip ergonomic handle prevents hand fatigue. For left or right handed use. Patented Grip-EZ handles are ergonomically designed for less strain on your wrist and hand. 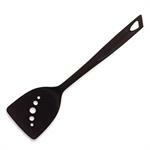 9" length makes it great for lifting small items such as sliders, little pancakes, chops, etc. 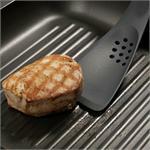 The Stainless steel slotted turner is dishwasher safe. It's not what you use this for, it's more like what can't you use it for! Stir, whisk, toss, blend, mix, lift, drain and serve. The Fiskie is the ultimate combination of a fork and whisk. A customer favorite! 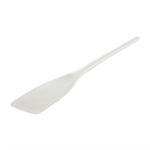 Flexible without being flimsy, this nylon spatula scraper is one tool you will reach for time and again. 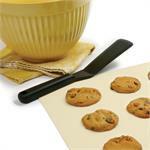 Lift delicate cookies, spread sauces, and easily slips around the beaters of your mixer. 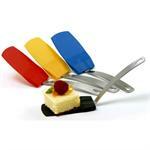 The ultimate in space saving design, the Uni-tool™ is five utensils in one. Use it to cut, drain, measure, flip, and spread. 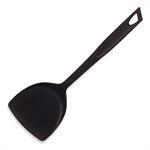 Made from tough nylon, it is safe for use with non-stick cookware and heat resistant up to 240ºC/480ºF. 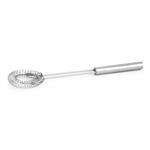 The Whiskle allows you to both whisk and scrape the sides of the bowl efficiently all with one tool. 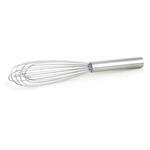 Use as you would any balloon whisk to ensure everything gets whipped and blended properly. Available in 8" and 13" lengths, these offset stainless steel spatulas are ergonomically designed to ease wrist strain when spreading or serving. 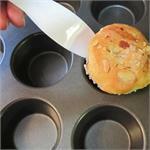 These work great for icing cakes or lifting squares out of a pan. The perfect size for everyday tasks and entertaining. These 6" silicone and stainless steel tongs are heat resistant to 535°F(280°C) and are available in a variety of colours. 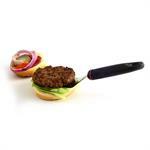 This heat resistant spatula is perfect for dishing up items that need drained, everything from burgers to apple dumplings. 10" length and one solid piece construction makes them sturdy but flexible. This knife will not scratch your non-stick bakeware or countertop. Cut, lift and serve with this strong, flexible knife. It will become a favourite in your kitchen too. Solid nylon is heat resistant to 410°F(210°C). 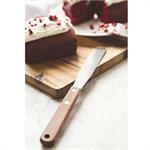 Ergonomically designed handle on this flexible spatula lets you easily slide under baked goods or small cooked portions, perfect for getting the first square out. Nylon head is heat resistant and safe for use with glass, non-stick, and any other surface. One of our favorite lifters. 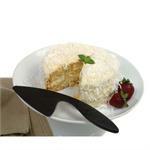 The unique beveled edge design allows it to easily slide under food. 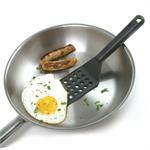 Sturdy, yet flexible and safe for non-stick and all types of pans and bakeware. Constructed of 1 piece of molded nylon so there are no place for food and grease to hide. The extra long handle keeps your fingers away from heat and pan edges. 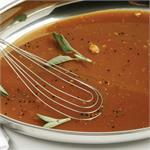 The holes allow excess grease or sauce to drain off. Just like you can't put a round peg into a square hole you can't put a round spoon into the corner of a square pan. The design of this spoon lets you dish up casseroles and desserts from square pans and containers, getting every bit out of the corner. The extra long handle keeps your fingers away from heat and pan edges. The turner head is at a comfortable angle with a slightly raised back edge, this helps keep your sauces from dribbling off the back of the lifter and also provides extra rigidity.